Black and White filters and RO units are designed for easy modification. 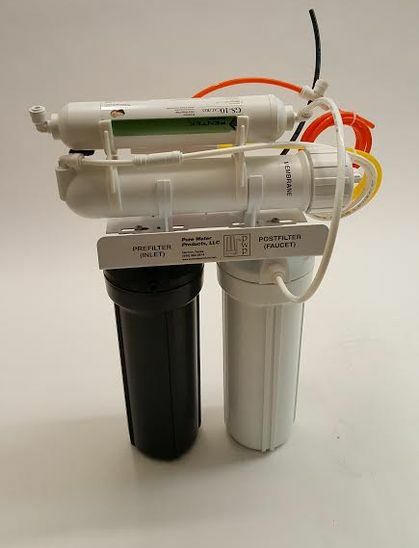 If you want to add a fourth stage to your three-stage Black and White RO unit (a calcite post filter to raise pH is the most common addition), we have a kit with everything you need. The picture shows the finished modification. Install the inline filter on top of the membrane as shown in the picture. You’ll want to determine which way the water flows through the filter by looking at the directional arrow. When the inline is mounted on the membrane, use the 1/4″ tube to connect the white vertical housing to the inlet of the inline filter, then attach the faucet tube to the outlet side of the inline filter. Turn on the water and check for leaks. The new filter will need to be rinsed for 3 or 4 minutes.